Connect a DisplayPort-equipped PC to a DVI display, with an active 6ft cable. 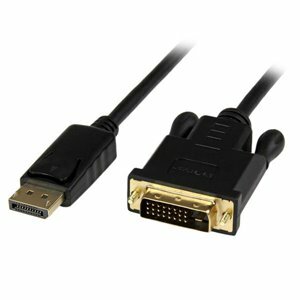 The DP2DVIMM6BS6ft active DisplayPort to DVI converter cable lets you connect your DisplayPort-equipped desktop or laptop directly to a DVI monitor or projector with no additional adapters or cables required - a cost-effective solution for enabling your new DisplayPort computer to work with an older VGA monitor or projector.For guaranteed compatibility with virtually any DisplayPort output the active DisplayPort to DVI adapter supports multimode (DP++) as well as single-mode DisplayPort signals. Unlike passive adapters, this ensures the DP2DVIMM6BS can be used with graphics cards that are not capable of outputting multimode DP++ signals, such as ATI Eyefinity cards.Plus, because the converter cable supports video resolutions up to 1920x1200 you can convert a DisplayPort video source to DVI without sacrificing video quality.This adapter is not compatible for use with the Apple Cinema Display. For guaranteed compatibility with virtually any DisplayPort output the active DisplayPort to DVI adapter supports multimode (DP++) as well as single-mode DisplayPort signals. Unlike passive adapters, this ensures the DP2DVIMM6BS can be used with graphics cards that are not capable of outputting multimode DP++ signals, such as ATI Eyefinity cards. The DP2DVIMM6BS is backed by a 2-year StarTech.com warranty and free lifetime technical support.